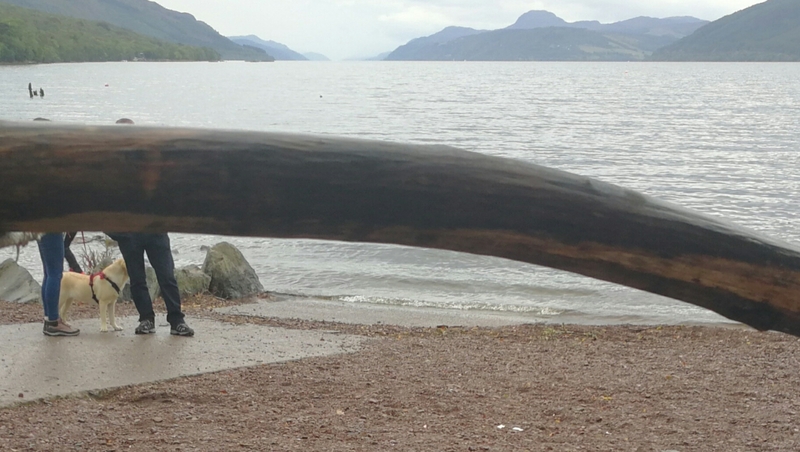 Steve Feltham – Nessie Hunter » A ‘log’ical explanation. One possible explanation of truly unremarkable photograph. 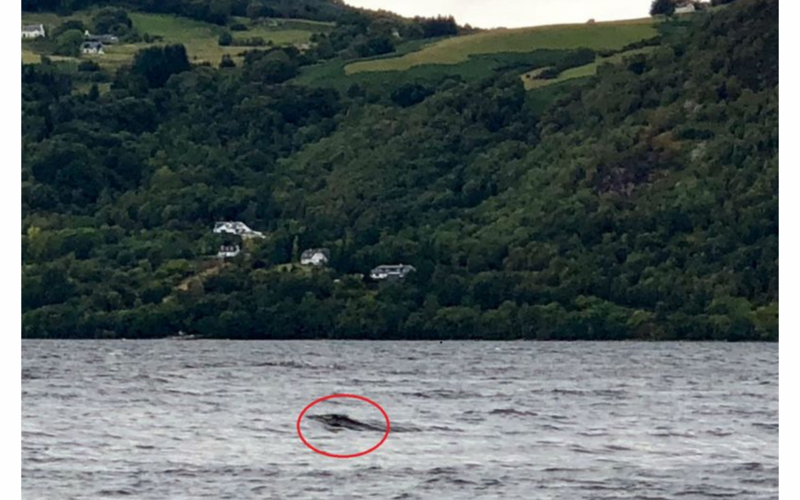 This summer it’s hardly seemed that a week has gone by without there being yet another eminently debatable photo claiming to be Nessie reported in the national press. There is a simple reason for this, the journalists involved are not trying to convince the world that we indeed do have large unidentified animals swimming about in this particular Scottish loch, not at all. Their motivation is to fill column inches. Whether the picture is good or bad they do not care, so long as someone is prepared to be quoted as saying that they believe they have photographed Nessie, than that’s good enough for some of the national press. In some ways it’s a good thing, it keeps this mystery in the public eye. It’s certainly great for the papers to have such an easy story to fill those miles of pages, but ultimately I believe it only does damage to this subject because week in, week out anyone who thinks the whole thing is just dreamt up to fuel a multi million pound tourism industry, looks at the latest offering and laughs. The things I’ve seen lately preporting to be Nessie range from a boat wake, to a boat, wind on the water and even mud on a window. Ultimately it makes us all look stupid for falling for such nonsense. Luckily, occasionally there comes along a photo which actually does warrant some investigation, such as young Charlotte Robinson’s image that I reported on here recently. However, more often than not it is not worthy of much consideration. 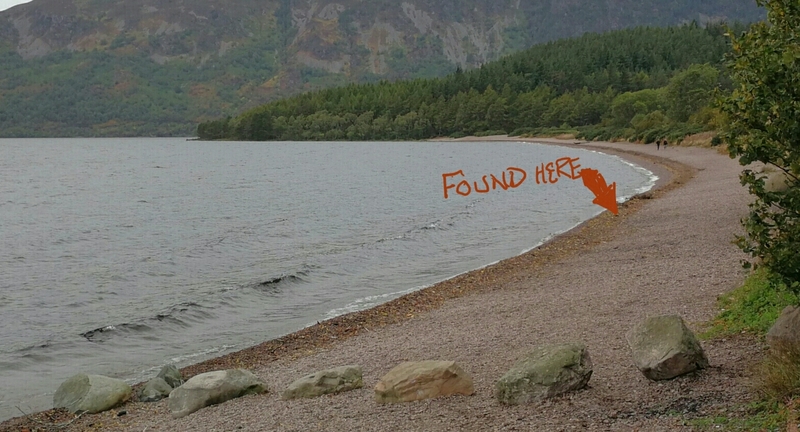 Take the latest, a photograph taken on Dores Beach, right along from my van on Wednesday September 5th by a Dr Dipak Ram. At worst nothing but a wave, at best a piece of wood. Only a few feet from the beach, it held no interest to me, certainly not the back of any animal that I’ve been waiting nearly three decades to photograph. This weekend I looked again at the picture, and pondered whether it could be a known object? Not just any object, specifically the piece of driftwood that I picked up two days after the photo was taken on Friday 7th, from what I estimate to be the exact same spot on the beach,as the original picture was taken from. …. This piece of wood. So today I donned my chest waders, retrieved the suspect log from my wood pile, and set it afloat. Here’s the third picture I snapped of it. Now bear in mind one or two details about this log…. 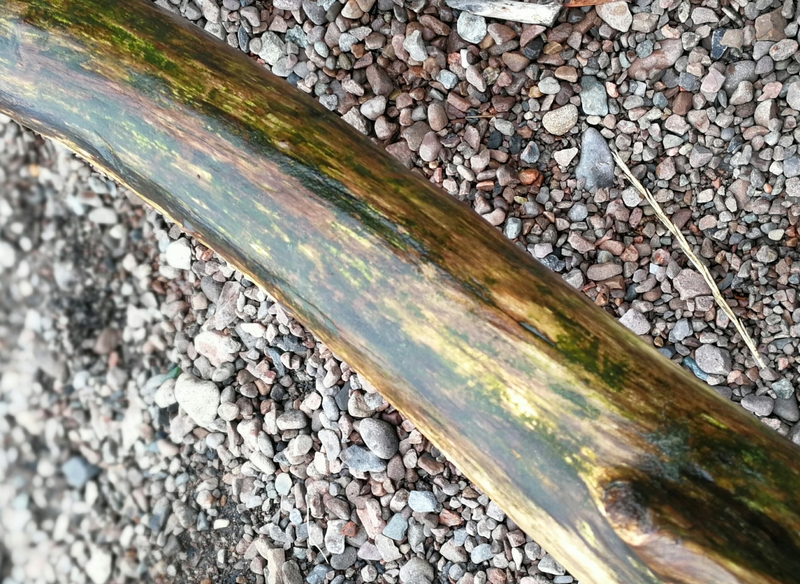 when I found it it was sodden, it had obviously been submerged for a long time in the loch, very heavy, and black with water and mould. It then spent ten days on my log pile drying out. So now when I put it in the loch again, firstly it looks much lighter in colour, and secondly it floats much higher in the water. It now weighs half what it did when I found it. Also i must admit that my log is a great deal closer to the shore than whatever is in the original image. That is not so much in the interests of accuracy, as in the interests of not losing my newly found piece of winter firewood just in the name of research. This photo as well as showing the location where I found the log, also shows clearly that driftwood is in very short supply on this beach this autumn. Here’s a detail of one end of it to give some idea of the amount of algae on it even after so long drying. Note the colour change of the log after only being back in the water for less than ten minutes, substantially darker. And contrary to popular belief, no flippers, but she does seem to have sprouted little legs! I am not saying that this is definitely what is in the original photo, I am just saying it could be. There’s been a bit of a disaster. 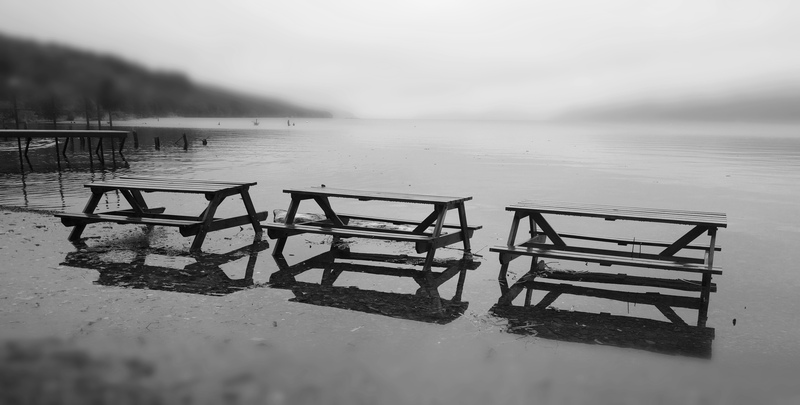 Late last night, in the driving rain, I took my log down to the shore, and heaved it back into the loch. I did this in the name of research, to demonstrate that when sodden with water this log is pretty much jet black. The disaster this morning is that my log has vanished. I have walked the length of the beach in search of it, but no sign. The way the wind and rain was coming in last night I was sure it would be lying on the water line, black as a black thing, heavy as stone. I can only assume that it has sunk back down to the loch bed. Divers tell me that just 50 feet off of the beach there is a band of tangled driftwood on the bottom, looking to all the world like an elephant graveyard. 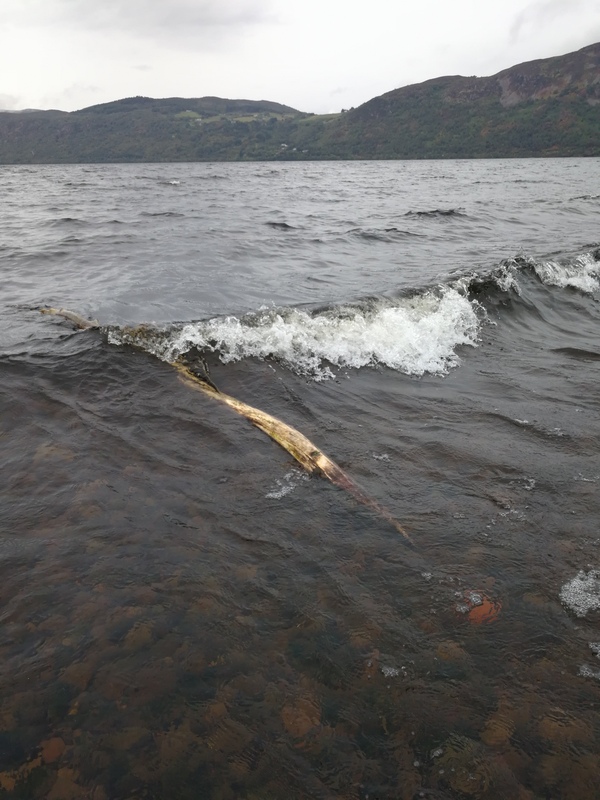 Driftwood pushed into Dores by the prevailing wind gets trapped in this corner of the Loch. Once the wind that has bought it here subsides the wood has nowhere to go. It remains floating in the bay, but ultimately when it becomes too waterlogged it just sinks to the bottom. There it remains until a winter storm of sufficient strength stirs it from its resting place and heaves it up onto Dores Beach. Black as black, heavy as stone. My log was one of them. I will recognise it when next it makes landfall, until then I guess I will have to just wait here for it. Of course there is another possibility, someone else got to it this morning before I did, and had it away for their fire, that’s possible. Anyway, here’s a photo of how innocent Loch Ness is looking this morning.